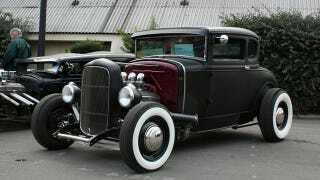 Is the 1932 Ford the greatest car of all time? Edmunds.com released a list of the 100 greatest cars of all time this past week which gives the 1932 Ford top honors. Their list is an interesting read and is by their own admission "a biased list in favor of cars that enthusiasts love" with historically important models mixed in. We don't think a top 10 list has ever existed that is unanimously agreed upon, so a list ranking the 100 greatest is certainly a momentous task, bound to start some arguments. Like everyone else, we had a few modifications to their list in mind that would make it "perfect". Our first move would be dropping the Nissan Leaf and Porsche Panamera and replacing them with the 1957 Chevrolet Nomad and the 1970 Plymouth Superbird. We would probably reorder a few cars slightly to personal taste, but on the whole it is extremely well done. Any list that recognizes the importance of the 1949 Oldsmobile 88, gives the Grand National/GNX the respect it deserves and reinforces our personal belief that Camaro IROC-Zs from the 80s wore the "best-looking 16-inch wheels ever forged" has to be good. The non GM muscle car choices weren't bad either. It's not quite a question of the weekend, but we want to know what modifications you would make to this list. What cars do you think got left out, or shouldn't have been there to begin with? Do you think any cars were ranked far too low or far too high? Perhaps most importantly, do you think the 1932 Ford is the greatest car of all time?